Our eight readers know well we’ve been off the air awhile (thanks for telling us :~) So long we’ve been absent our custom font seems to have lapsed (can you tell the difference?) and our browser required updating. We’ve continued to read and live, and travel, just stopped writing awhile. We’re in new territory, so to speak. Haven’t traveled in the trailer since April 11, yet visited a week each in Dayton OH, Chattanooga TN and Myrtle Beach SC and are heading to the Bahamas in a week. Our next towing trip is not until end of June when we head to Du Quoin IL. This time last year we had cruised by NC for a nice week-long visit with family then immediately headed to Carlsbad NM to join up with a WBCCI caravan. What a difference a year makes, eh? This year our plan is 180 degrees apart from previous three years. We are visiting with family and friends (sleeping around, as it were) and not focused solely on traveling with our trailer. The days between the trips we’ve spent playing tennis, performing maintenance on the trailer and truck, and messing with amateur radio. How could anyone have time left after all these? Okay, we’re also catching up on our sleep, enjoying hanging out with family, and helping a little around the house. I’m watching French Open semi-finals live as I write this from a Myrtle Beach fourth floor condo, watching Djokovic and Federer break each other’s service games. Deb and her parents are hanging out on the beach a couple of hours, so I can concentrate almost fifty percent on writing. The weather here is already hot and summer isn’t here. We thought we’d find relief from the mid to high ninety degrees days we were enjoying in Kannapolis. Weather forecasts called for mid 80s at the beach. The light breezes are helpful but it is still hot here. I’ll catch some sun right after the Djokovic vs Federer match, the sun won’t be quite as high then. Myrtle Beach has been great, eating a great seafood dinner at Sea Captain’s House, playing mini golf, and relaxing a lot. The Palmetto Shores condo building, has numerous indoor and outdoor swimming pools, hot tubs, shuffle board. What else do we need? Oh yeah, cable television for French Open tennis viewing. The guys are back on serve again in first set. 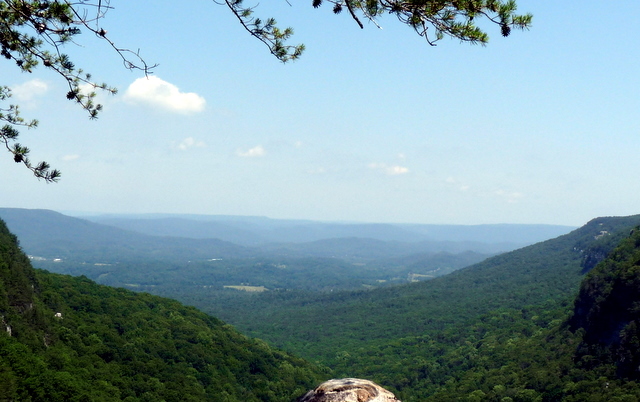 Last week we stayed with my sister and brother-in-law on Lookout Mountain TN. They showed us Cloudland Canyon SP and Lookout Mountain Flight Park. 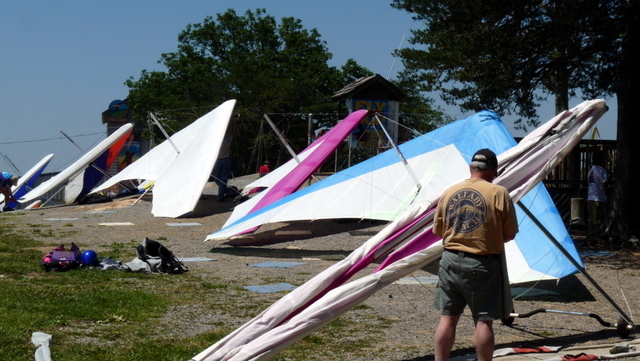 The latter is America’s #1 hang gliding center and is really interesting. We went to Chattanooga to attend the memorial service of a friend, Nancy Williams NR4RR (SK). The service was sweet and warm and uplifting, a nice celebration of Nancy’s life and works. We really liked the witnessing by her two sons, sharing so much of her character and how she showed her love for them and her husband of almost fifty years. 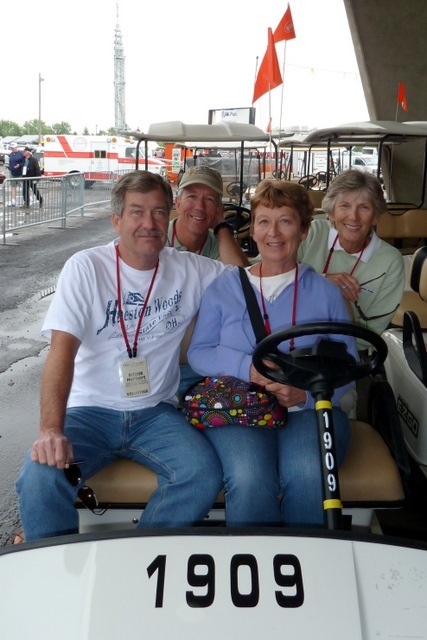 The week before we spent in Dayton OH staying with friends Charlie and Janet, along with Herb and Lois, all amateur radio friends we’ve met through our club, WBCCI Amateur Radio Club/RV Service Nets. We all volunteered at amateur radio’s biggest event of the year, Hamvention. 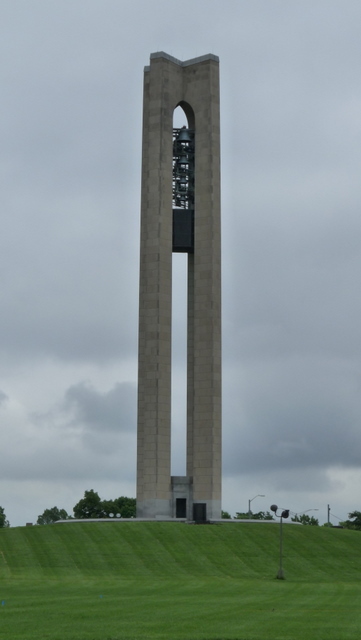 Hamvention, organized each year for over fifty years by Dayton Amateur Radio Association, is the largest amateur radio convention and hamfest in the world. Hundreds of vendors rent display and sales booths indoors and flea market sellers occupy over 2,000 spaces in the paved areas surrounding Hara Arena. We served as shuttle cart drivers pulling two to four hour shifts each of three days. Some folks need help getting heavy purchases to their cars. Others might have physical challenges and require a shuttle ride from and to their parking area. We enjoyed meeting people from all over the world, learning about their shopping list or how they will use their purchases. Charlie and Janet did a great job showing us around Dayton. We’d been there before but lacked the insider’s knowledge and viewpoint. They showed us around Carillon Park and The Packard Museum, shared their favorite pizza stop with us, and let us read their WSJ every morning. Great hosts, eh? 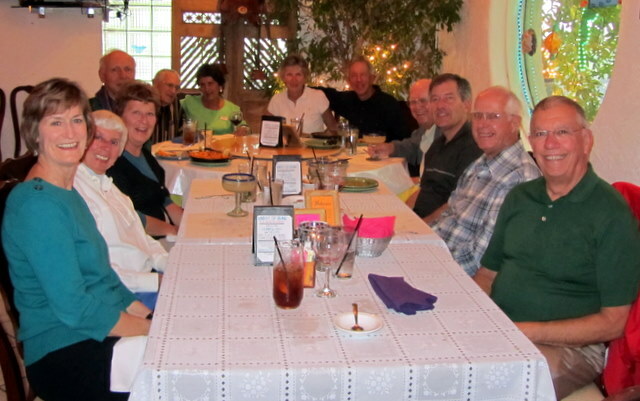 A real high point was our small reunion of friends at El Meson. Ham radio friends Herman and Gloria own and operate it. They are great cooks, hosts, and managers and the food and drink at El Meson are out of this world. Debbie and I shared a paella and a few margaritas after appetizers of empanadas and coconut shrimp. Check out their menu or, even better, their restaurant. WOW! One afternoon we rearranged an end of Charlie’s fine working hf Mystery antenna. We used all the requisite tools: a bow and arrow, fishing line, rope, halyard pulley, bricks for ballast, and Boy Scout knots. Our play paid off, the antenna looked more level and worked just fine. We had a lot of fun staying in a houseful of hams, working from Charlie’s great radio station. Travels without our trailer have been busy, full, fun, and a little confusing. Several times we’ve thought, or said, “we have it with us, we’ll go get it.” Then we realize and laugh. All our stuff is in our house. We don’t have much with us when we don’t take the trailer on travels. 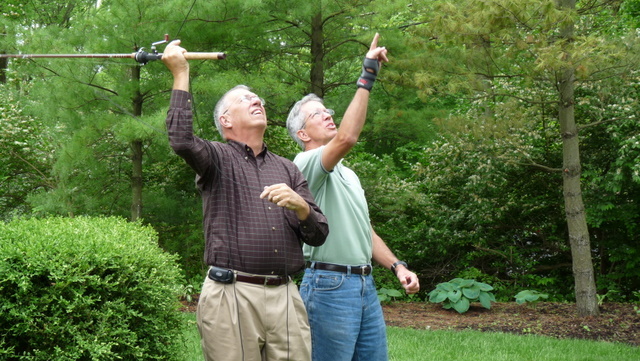 This entry was posted in amateur radio, Full-timing, Maintenance, Traveling and tagged cloudland canyon, el meson, french open, Hamvention, lookout mountain flight park, myrtle beach, mystery antenna, sea captain's house. Bookmark the permalink. You have nine readers, don’t forget to count me. Thanks Cal — Nice to hear from you. Glad all is well and life is good. Hey you instigator — you did it again, made us get back on the keyboard. Thanks! Good morning Bob — glad to have you aboard, and we’ll try not to get you bored. 10 readers! I just started reading your site a few weeks ago. I’m the one who suggested Blowing Rock, NC as a place to beat the HEAT. I don’t own an Airstream yet. However, your website gives me lots of information to consider- thanks for that. Also, I really like the layout of your airstream- a clear division of lounge, kitchen/dinning, and sleeping area. I don’t care for the newer design with a sofa in the kitchen area and the kitchen cabinet that breaks-up the flow of the walking area, plus there isn’t counter space, just cutting board space on the 23 foot. Anyway, thanks for all the great articles (I’m enjoying going back and reading them for the first time). Well Donna, would you accept #11? Bob just beat you out of 10 by a few hours. Could this be a marker of economic (or non-economic) activity, more people are spending time reading (and dreaming?) about the good life? Thanks for the Blowing Rock suggestion, it’s a great one especially right now. And we agree wholeheartedly about our floorplan — it suits us to a tee. We browse the currently available ones and would have to go to the new Classic 30 or 31 to match all the comfort and luxury we have with our 25 CCD International. Hopefully we won’t have to change trailers. We love our 25 for it’s completeness and compactness.